On SävCon X I was invited to be on a panel/workshop on game design, a few minutes before the panel started Linus Råde asked me what I thought of his game, Krutrök & Sägner (Gunsmoke & Legends). It had been a more than year since we traded games. My memories of the game were pretty weak, small brown book, blackish illustrations, and not much more. Now that I’m back home again I thought I’d rectify that lapse. Especially since I actually played the game with the author at a con a few years ago. Krutrök & Sägner is a 144 page book in A5 format. Richly illustrated by Edelfelt, Malmström and Kittelsen. I assume that all the illustrations are in the public domain these days, I recognize a few of them from old school books. The text is laid out in a two column format and at times it feels like reading a history school book. The game is an historical game set in Sweden at the time of the Finnish war, i.e. the one between Sweden and Russia 1808-1809. 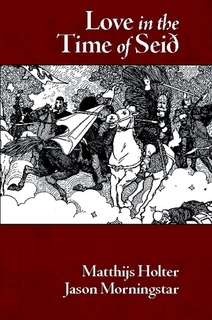 In 40 pages the reader is given a history of the war and an overview of the Swedish society at the time. There is also a section on folklore, with stats for some traditional Swedish monsters. The folklore monsters are optional, to be used if the players find the historical period a bit dull. Character generation is a point-buy system. The rules are simple, roll under or equal to stat+skill+difficulty with 2d6, fumble on 6/6, critical success on 1/1. There are also simple combat rules, and rules for falling ill and getting infected wounds. The narrow focus on death and disease in the rules give a rather gritty feel to the game. The form is traditional, a GM (kept in check only by the rules) and a group of players that focus on playing their characters. The setting is OK, considering the limited space in the book the reader is given enough to work with to run a few games. But a few good adventure/campaign seeds would have been helpful to a GM new to the hobby. The rules are good, it is a gritty setting and the rules support it well At the same time the rules are simple enough not to get in the way of a good story. The form is very good. The game assumes a very traditional stance on how RPGs should be played, and it explains how to run such games very well. The section on scenario construction is one of the better I have seen. It is followed by an example scenario following the same pattern, with pre-gen characters for those that want to jump right into the action. At the workshop Linus talked a bit about his creative process for writing this game. He started with the layout, and then wrote rules, setting etc, to fill the spaces left between the pictures. This explains the very terse section on advanced GM’ing advice, where two out of three ideas are given so little room that I’m having trouble understanding what he is trying to say. Still the advice given to the beginner is outstanding. No. The setting feels too much like school to me and the form is not to my liking. Before Christmas last year I played While the World Ends and posted about it, that post was mostly about the mechanics in the world building phase of the game. Two days ago I played in a great game at SävCon, and thought I’d share a bit about the play phase of the game this time. To put the story into context let’s have a look at the setting as generated in the first phase. The society in the story was based around some perverted classical musicians dream. A strict class society, called Clef society, with three grades of citizens G clef (administrators, foremen, managares), C clef (qualified, white collar labor) and F clef (blue collar), all ruled by a master class of Tenors. All children were taken away from their parents at the age of 5 and put into schools, that had a focus on making them good citizens and finding their place in society. Honing their skills in that area. All citizens were supervised, and those that were not up to standard were modified using cybertech to bring them up to level. The society also had enormous problems with pollution, the very soil beneath their feet was poisoned. All food was grown in greenhouses, only artificial grass in the gardens etc. We decided that the story was in fact a BBC low budget production from the 80’s, the kind where you wrap lamp posts in aluminum foil to make them more futuristic. The bicycle factory was there for budget reasons, a more fancy factory had been cut from the script to keep the budget down. Cybertech was invisible. All scenes were shot using too much blue, making everything look cold and lonely. The society faced a rebellion ‘The Dissonance’, rebellious music teachers in the schools that taught false teachings to their most brilliant pupils in order to change society from within. Ideas of free expression and improvisation were starting to spread. The two different outcomes of this rebellion was ‘Success, society becomes a kinder place and we shot the epilogues with warmer colors.’ and ‘Failure, even stricter censorship is put in place at all levels of society killing the last sources of joy.’. Synthia (-), a student at the Wagner Institute. Brilliant pianist and Tenor material. Her goal was to get away from her tutor Serena, a rebel, who she thought was corrupting her perfect piano playing skills. Her fear was that Serena would indeed succeed and that it would spoil her chances after graduation. Michael G (-), a foreman at the construction site on the new Sonata area. His goal was to form a duo (marry) with Katherine G, a shift manager at the Fuga Bicycle Factory. His fear was that the soil he had been exposed to had given him cancer. 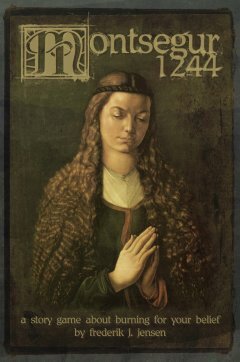 Mary F (+), the mother of Thomas, a student at the Wagner Institute. Her goal was to get her beloved son back. Her fear was that the sick soil and lacking maintenance of the institute would make her son sick, and kill him. Samuel Tenor (+), an evaluator at Performance office 4, spending his days deciding which citizens that were substandard and in need of adjustment. His goal was to find the joy in music he had felt as a child, and he feared that his last adjustment had been insufficient to make him good enough to keep his position at the office. A full recollection of the game would be the length of a book or movie script. But the scenes that follow were some of my favourites. Michael G in his intro. Pacing the office preparing to make a call to his love Katherine G, practicing what to say. Picking up the phone, starting to dial, chickening out. Practicing some more, and then really making the call. Rolling the dice to see if the call would be successful, failing, and just as he touched the phone have it ring. The hospital calling him to tell him to come in for further testing. Mary F, meeting her son at the Institute. Giving him a cake that has used her entire sugar ration to prepare. And then in a subsequent scene we see him and his friends, hyper active from the sugar after sharing the cake, play in the gymnasium. One crashing into a wall, making a small crack, through which the poisonous soil slowly starts to seep into the hall. Samuel Tenor, watching a class of piano students through a false mirror. And after hearing Synthia being forced into playing wrong by her rebellious piano teacher, accepting sponsorship of her. The piano teacher became a favorite character of mine, and I played her in all her scenes. Synthia and Serena playing four handed after Synthia had called her sister on the outside to raise the alarm about how Serena was ruining her. Serena had been forced to give up her exclusive mentoring of Synthia and share it with a more traditional teacher. They played Erik Satie’s Gymnopedies together, with doctored sheet music that only showed the notes and nothing else. And I managed to touch the player’s heart with my description of the sadness and despair in Serena’s playing. Samuel Tenor attending an by-invitation-only concert with his protege in the Fuga Bicycle Factory, after hours. And hearing her battle against Serenas manipulation of the music on the piano. Mary F kidnapping her son from the institute after he has fallen ill. Taking him home with her and hiding him from the authorities. Michael G, finally in the epilogue, gathering courage to ask for Katherine G’s hand, only to have her swept away by Samuel Tenor right before his eyes. That hates-relation that I drew during setup really showed itself to be true. In the end Mary F managed to win the victory to the rebel piano teachers with her struggle to bring her son home. The blue tinted filter was removed, and the epilogues were shot in brilliant colors. Everyone reached their goals, except Michael G who saw the love of his life kiss his old nemesis. The game has ended, (+) won. Open picture to see all details, but beware it's all in Swedish. 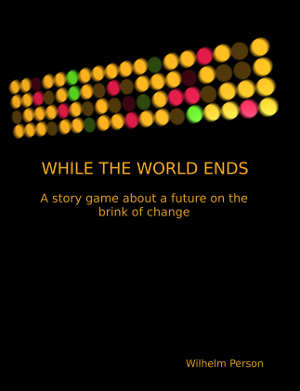 While the World Ends can be played in two different ways. You can play it as a tactical board game, looking for the optimal relation to add next, setting your scenes carefully to rob your opponent of advances where he is strong. Then the game gives you the scenes to show how those events came to be. Or, you can play it as a story game, narrating scenes that you think are the logical consequence of what has already happened, and use the board to keep track of the events and relations introduced. Then the game will tell you where your story is going. Both ways are just as valid and fun to play. And the game does not break down if different players around the table select to play differently. The game is balanced (read random) enough that the story gamers still can win. Like they did in this game. This is a new rule that I have been testing in the last few games. It is not in the book, but if I ever get around to making a revised edition it will be. Once the victorious side has been decided and winners have narrated the change, players that want to can make a roll each for reaching their goals during their epilogues. Set the scenes as usual, they can roll even if there are no change tokens left in the location. This way more of the main characters’ stories reach a conclusion. The roll is optional, if a player is satisfied with the story as it is without reaching either goal or fear then don’t roll any dice. Just tell his or her epilogue like usual. www.lulu.com/product/paperback/while-the-world-ends/13659977 – WTWE page on Lulu. Zombie Cinema and Lady Blackbird were the most popular games in the Indie Gaming Lounge on SävCon X with five plays each. Since we had brought ZC several years already, and it was very popular we had intended to not offer it at all this year. But we got two new hosts, who both love the game, so we kept it for another year. ZC is one of the games I have played the most in the last years, and I thought I’d share my thoughts on actual play. We pitch the game not as ‘a zombie RPG’, but as ‘a zombie movie RPG’, and it is popular both with beginners and veteran players. Since the rules are very simple and easy to explain, and the players make the setting together before play starts the time from sitting down to actually playing the game is very short. On SävCon we have players that have returned every year and asked for it again. But this year I forced them to play Love in the Time of Seið instead, the IGL is about finding new favorites, not playing old ones! Start with building the setting. Make sure to have a setting and a situation that would be interesting even without zombies. ZC works the best if you first play it as another kind of story, and then have the zombies appear. Don’t start from a stand still and let the story linger while you wait for the zombies to come on so that you can get the action started. The PCs should already be doing stuff important to them when the zombies appear. Then build characters the usual way. Make it clear to the players that it is perfectly fine to swap out cards that they don’t like, or even to trade cards with other players. Extend the character generation with building small name signs for the PCs from scraps of paper. Since there are no character sheets it is easy to forget the names of the other PCs, or even your own. The signs solve this problem. Do the first round of scenes as pure introductions of the PCs, don’t bother with the conflicts and don’t advance the zombies. This is just practice at setting scenes and at the same time we learn what the PCs are like. 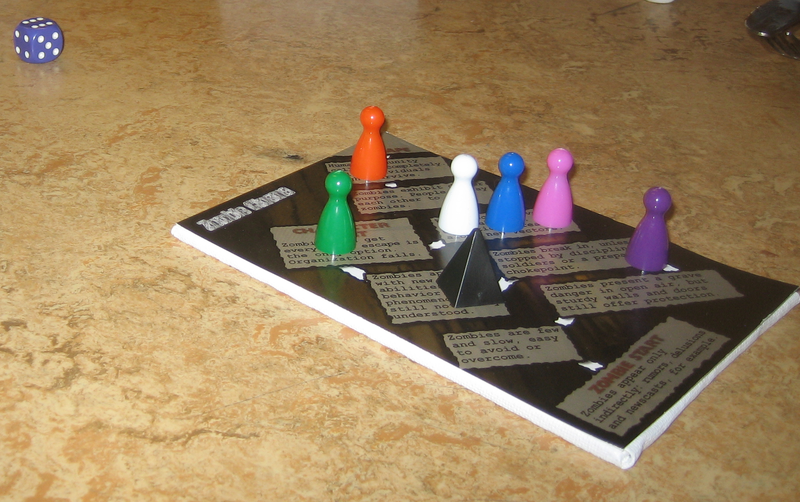 Once the first round of scenes is done, set up the game board, explain how to read it and how to do conflicts. Now you can start playing by the book, or in the case of ZC ‘by the dark gray sheet with tiny black print’. My advice is to keep the zombies out of the story entirely until the first PC is eaten by them. Play the game, follow the situation that you set up while you decided upon the setting. Let the PCs follow their own agendas. Listen to APAP #14 for an example of how this works. If you should find yourself as a zombie player, know that the stories get more interesting when the players are forced to let the PCs have conflicts with each other in order to advance. Dodge open conflict, attack or threaten NPCs rather than PCs. Don’t forget the epilogues, they wrap up the game nicely. I wonder if I broke some kind of record with Jason’s and Matthijs’ game Love in the Time of Seið. I read, translated and played it three times (with different groups each time) it all in less than a week. The game has a sort of emergent quality to it. Just reading the game the first time didn’t really tell me how cool it was. It was in the translation work and the subsequent actual plays that I figured it out. I thought I’d share some stuff that I didn’t see in the book, that could be useful if you’re going to play it for the first time. Yes, I translated the game into Swedish before playing. I bought the dead tree version, had no photocopier and I didn’t want to cut up the book. So when I had to make my own handouts I took the detour and translated them at the same time. All plays were done with my translated handouts. But really, the game would have played just fine without the translation. There isn’t very much text for the players to read. But the new format was convenient never the less. 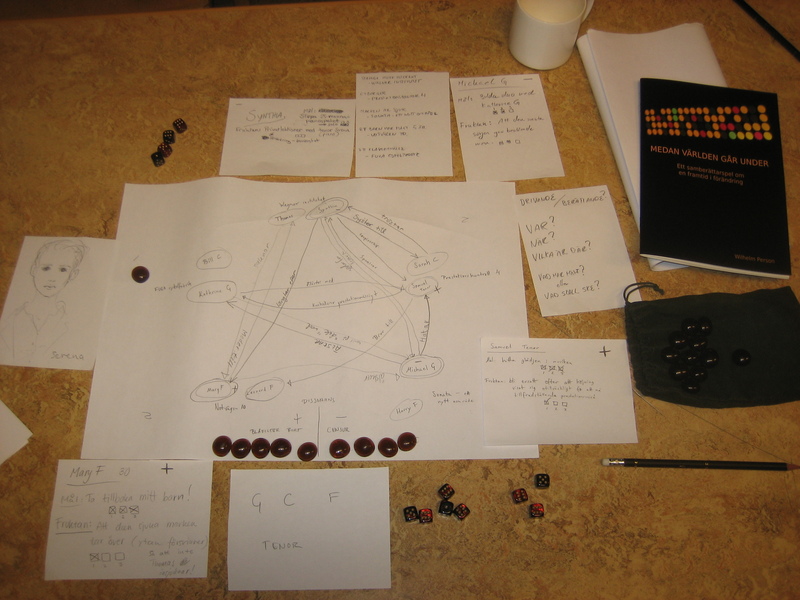 I pitched the game as ‘Shakespeare and Wagner write a viking story together!’, and that was really all the setting information that the players needed to decide if they wanted to play it or not. Do the warm up exercise as suggested in the book. We retold scenes from the Star Wars movies and a Mickey Mouse-cartoon. Pick something that everyone is familiar with, no need to waste creative energy at this stage. The focus is on the phrases, not the story, deviations from the original is expected. Make everyone read all characters, just like it says in the rules. The information is a bit thin, but if you read all of them you get a pretty good grasp of the situation. Also, it enforces the idea that the players have no secrets, even if the characters do. It helps if everyone thinks of the game like a play in the theater or opera. Each of the eight locations is one set of props that can be brought onto the stage by stage hands between the scenes. It also gives a mood and feel to the game that suits the story implied in the characters. The characters interact with each other or make monologues, they don’t interact with the scenery to any greater extent, remember, it’s all just card board. Characters that are not the PCs are done by extras, don’t give them the cool lines or stories. I played both with named characters and with characters that simply were The Princess, The Knight etc. Both worked well, but if there are no names to remember, there are no names to forget either. This is a theater play, written by people that have no concern for historical correctness. Don’t worry if someone does something that isn’t historically correct, or even that introduces minor inconsistencies or contradictions. Use the phrases if you need, but don’t let the game get bogged down. If a player leaves the game permanently, keep the character in the story. Take turns playing that character as needed, and even setting scenes for him or her. wilper.wordpress.com/2011/01/05/ … holter – My ‘Reading’ post for the game. Yesterday I got back from SävCon X, where I among other things played two games of Montsegur 1244 by Frederik J. Jensen. Together with our test run before the convention that makes for three full games. Enough for me to write a short post about the game discussing ideas, experiences and advice. My focus is my own, i.e. that of someone who intends to play the game at a convention, where all or at least part of the group will be strangers. 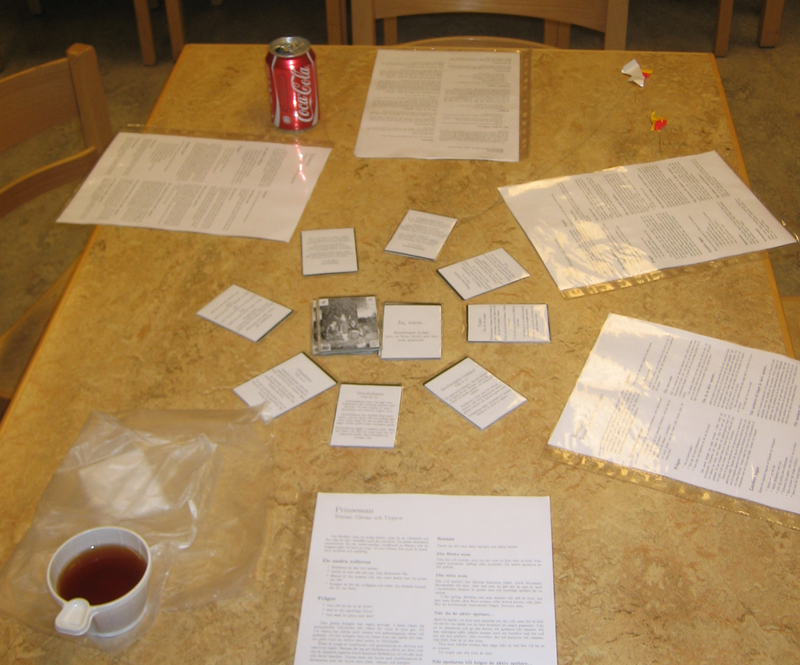 In the test run we used the English handouts provided by Frederik on the website in conjunction with the game book and translated the cards on the fly as we were playing, and read the longer texts in their original English. At SävCon we used our own fully translated version. I am by no means a good translator, but even my poor translation was way better for us than playing in a mishmash of Swedish and English. My advice: If you are not native speakers, spend some time before playing and translate everything to your native language, cards, act intros and background information. Even if you are good at reading English, your players might not be. Go on Wikipedia and www.cathar.info and read more about the Cathars and the crusade against them. There is information in the game, but it will come even more to life if you have more knowledge. Also, it is very interesting. I did suspect earlier, but after our first session I was certain, this is not a game suitable for minors. I usually don’t flinch at young teens that watch movies intended for an older audience. But I wouldn’t want anyone to be subjected to this without them understanding what they were getting into. The game includes themes of children in danger, sexual abuse, and people coming to harm, and they are not the nameless goons of a D&D game, they will be characters that the players care about. There are also strong religious themes in the game, we didn’t find any issues on that front ourselves, but I imagine that people with a strong faith (of any kind) could feel uneasy about that. I do not say that these things are bad and I wouldn’t want to remove those strong themes from the game. But everyone that are coming to the table should know in advance what they are getting themselves into. This is an awesome game, and I love it. But when pitching it (to mature players) I made sure that I explained that we put that ’18+’ on it for a very good reason. Many groups turned the game down, I am certain it was for the best. It really doesn’t matter who reads the act intros and background bits. Check before play starts if anyone is uncomfortable with reading aloud and offer to read in their place. Montsegur 1244 may be a very uncomfortable game, but it should not be for this reason at least. Faye and Amiel, the children PCs, live their own lives. Remove them during the character selection phase, and give both to the Arsende player. She gets to play them when, and can temporarily hand them out to other players if she wants to interact with them in character. Guilhelm, the old man PC from the expansion. Make him an old friend of Raymond’s father. That ties him tighter into the narrative. Give the players with Perfect characters time to read through all the background material before play starts. It really helps them. The game instructs the players to take turns setting scenes. I wouldn’t worry about setting scenes in order around the table (the book says nothing about turn order), just do it in any order. Let the player that has an idea for a scene set it. Don’t worry if the players don’t set the same number of scenes. Just make sure that everyone at least gets a chance to set one scene per act. Don’t distract the player that is setting the scene by introducing the next scene card at the same time. Wait until the scene is finished, then turn over a new card and read all three aloud. The consolamentum is an really interesting part of the game. Bring a Bible or at least a printout of the relevant sections, in case any of the players want to act it out in some detail, or even LARP it. Don’t kill off the entire cast of non-main characters in the middle of the story, the end-game will suffer. If a player can’t stay until the end of the session don’t kill his or her characters outright, just distribute them among the other players. 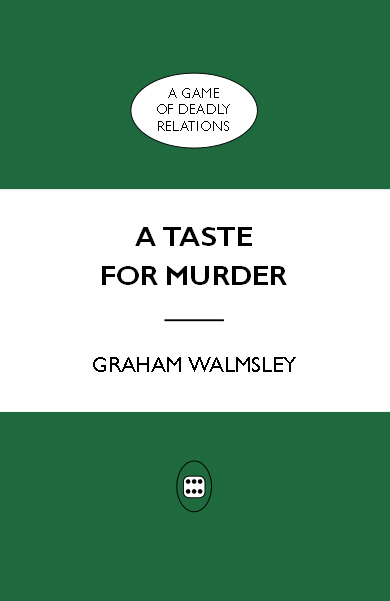 While dodging the packing my bags for SävCon I read ‘A Taste for Murder’ by Graham Walmsley. A Taste for Murder is a 9×6 book at 120 pages. There are no pictures except for the diagrams used in the rules. The layout has very wide margins and huge headlines, the book could have been much thinner if a more space preserving layout had been used, in spite of the page count I read it in less than two hours. The story takes place at an English country house in the 1930’s. The characters are visitors, family, servants or any combination thereof. As one can guess from the title one of the characters gets murdered after a while, and then story shifts into a sort of murder investigation where the victim’s player gets to play the brilliant Inspector Chapel instead. The rules are very focused, and only deal with the intrigues at the country house as the characters seek to increase their influence over each other, and the murder investigation. The investigation is not concerned about the method of the murder, and there is no element of gathering clues, checking alibis or other problem solving involved. Instead the investigation focuses on who had a motive for the murder, the first two players to get three motives for the murder face off and the loser is identified as the murderer and taken away. The game has no prep aside from very quick character generation and no player acts as a GM. Scenes are set by consensus, and there are a few tables that can give information like the weather at the time and so on. Players take turns acting out private discussions between pairs of characters, where they can get bonuses dice if they act in a way proper to predetermined moods. Roll dice, and then modify influence or assign motives. Repeat until the murderer is found. The setting is very good. I didn’t know anything about the life at country houses in the 1930’s, but after reading the setting bits in the book it feels like I know enough to play stories set there. The rules are very good. They are entirely focused on the vying for influence between the characters and the discovery of motives for murder. The form is excellent. Graham dedicates 20 pages to an extended example of play, and there are numerous tips on how to play (and how not to play). Yes I’d like to play it. But since we would be playing in Swedish I would first have to find translations to all the various titles of servants etc, to keep the game genuine. Also there does not seem to be any character sheets etc for download, another obstacle for getting the game to the table. theunstore.com/index.php/unstore/game/78 – ATfM page at the Unstore where the game can be bought. I have been busy preparing for SävCon X the last few days. NordNordOst are going there to host an indie gaming lounge. It all started when we played Montsegur 1244 before Christmas. It was an awesome session, but we felt it was a bother having the material organized the way it is in the book. After Christmas I translated all the cards, and Anders made a new PDF for us with the cards. I also translated the background information sheets and built a cheat sheet. After seeing our new Montsegur 1244 I got sort of carried away, and thought it would be neat to give Love in the Time of Seið by Jason Morningstar and Matthijs Holter the same treatment. Love in the Time of Seið is a 40 page 9×6 book. It has nice layout and reads in an hour, to actually understand the game it took me a whole day of translation work, but reading it went quickly. There is (public domain?) artwork by Victor R. Lambdin, E. Boyd Smith and Abbie Farwell-Brown. The second half of the book consists of stuff that is meant to be cut out, cards and character sheets, in order to play the game. If you think it would be heresy to put scissors to a book, don’t make my mistake, buy the PDF version rather than the print one. The setting is a pseudo viking one, sort of what would have happened if Wagner had written an RPG. There are only eight locations in the game, but each is given three different description blurbs, allowing for some variation if the game is played multiple times. For each location there are also a set of suggested events that can be used to drive the story forwards. The game puts five characters into an interesting situation, and then the players are left to explore what happens next. There is not much in the way of rules, no stats, no combat system, no skill checks and no real conflict mechanics. There are resolution cards (‘Yes, and…’, ‘No, but…’ etc), familiar from Itras By and Archipelago II, that can be used if the players want to introduce an element of randomness. Other than that it is just story telling, what you say is what happens. The game comes with five pregen characters, defined by their relations to the other characters, questions that should be answered about their history or future and themes that are central to them. It would be possible to build your own by the same pattern, but that would be almost the same as a completely rewriting the setting. The form is GM less. And no prep is necessary (other than the assembly of the game materials as such). The players take turns setting scenes for their own characters. When not playing the main character the players are given various tasks to support the storytelling. A warm-up exercise is provided to help teaching the rules. The setting is good. It would have been nice to have more to work with, but on the other hand the game is expected to play in three hours. You don’t need much setting for such a short game. Three different descriptions for each location adds replay value. The rules are very good. There is no depth or nuance at all. But the rules are intended to support the story telling, and that they do. The form is very good. It is clearly explained how to play the game. The cards and play aids puts the focus on the right things. After first reading the game I was sort of disappointed, was this really everything the game had to offer? And the play aids we assembled looked rather crummy. 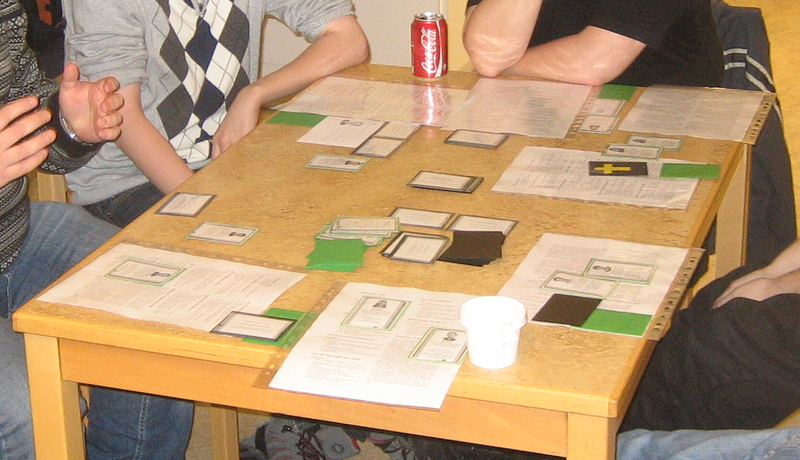 Then our planned session got a cancellation and we played Polaris instead, and that was it. But now, after translating the game, and therefore really studying it, not just reading it, I have changed my opinion. This game is very cool. The characters and situations are connected in interesting ways to a much higher degree than I realized when I just browsed through the game. I’ll bring it with me to SävCon and I will play it as soon as we get a group of four willing players. www.lulu.com/product/…/11175734 – Lulu page for the PDF version of the game. norwegianstyle.wordpress.com/…-sei%C3%B0 – Release announcement on Norwegian Style. Space ships, space suits, planetary orbits, zero gravity, scientists as heroes, faster-than-light travel; the stuff our SciFi dreams are made of. A while back I took a look at the old Traveller game, and found it nice. Diaspora leans heavily on that tradition, but offers a more modern rules set. 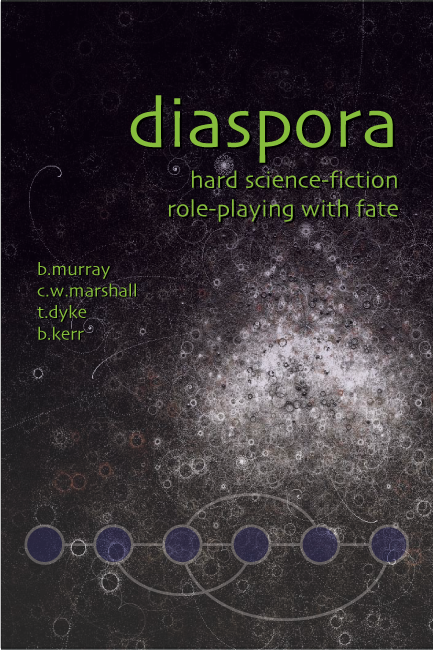 Diaspora by Brad Murray, CW Marshal, Tim Dyke and Byron Kerr, can be bought from various sources, mine comes directly from Lulu, and is a fine example of what quality Lulu printing has on a good day. Both the book itself and they layout inside oozes of quality. All the art inside (mostly space ships and diagrams) looks good. The book is 270 pages, 9×6, and while it isn’t exactly a wall of text inside, much material has been squeezed in between the covers. It took me a few evenings to work my way through the game, and I’m still not sure I have gotten everything in the rules right. Diaspora provides the tools for generating worlds and systems, and players are meant to build their own setting first in the same session where they generate their PCs. A pre-generated system is included, but part of the game is really to build your own setting. Some assumptions are given, humans have access to slipdrives that allow FTL travel between systems, but not inside them. Besides that things are rather ‘realistic’, huge space ships, no fighter battles, spend half every trip accelerating and the other half breaking, preferably at 1G, as there is no artificial tech in the setting. The PCs are expected to have a space ship and play adventures with the focus on making enough money to play for the upkeep of the ship. Just like Traveller, but with significantly less paperwork around the economics. But the rules would support most other styles of relatively hard Sci fi I can think of too. The game uses a hacked version of the FATE system, as known from Spirit of the Century, and the authors frequently make references to the SotC book for further details. The game looks complete to me though, no real need for the SotC book in order to play Diaspora. No stats, but skills and aspects. Roll 4 Fudge dice, add skill and beat the target number to win. Use aspects to get bonuses. There is no advancement as such, but the players are expected to make minor reassignments of their points between sessions, to reflect character development. A neat system, I used it myself in Höstdimma, no need to balance anything for different power levels, and a new player in the group can jump right into the fray, power level wise at least. Character generation uses a very free lifepath system, where the players invent their own lifepath options along the way, and write small pieces of fiction for every term. Then the aspects are derived from the fiction. The build your own setting theme shines through here too. There are four different combat systems in the rules, personal, platoon level, spaceship and social combat. They are surprisingly crunchy for an otherwise so light game, but there are cheat sheets included. The form is traditional with GM and players. But the option is given of having everyone in the group make one character each, and then rotate GM-ing duties on a per session basis. The GM is encouraged to hand over much responsibility, including parts of the generation of NPCs, to the players. The setting is OK, there are some things suggested in the book. But the core is to have the group build a cool setting first. The rules are good, they cover situations common to the genre I imagined when I read the book. Light weight until you run into combat, then more crunchy. The form is OK, there is some advice on how to run the game, but the authors point towards SotC for the details. I would not put this into a beginner’s hands, there are better games for those situations, but for the experienced group I think the ideas presented in the game would be a lot of fun. Yes, I might. Diaspora will be my first choice for Sci Fi games from now on. I get Seikai no Monshō vibes when reading the game for some reason, it shouldn’t be that hard to make any necessary adaptations. www.vsca.ca/Diaspora – Official Diaspora page. 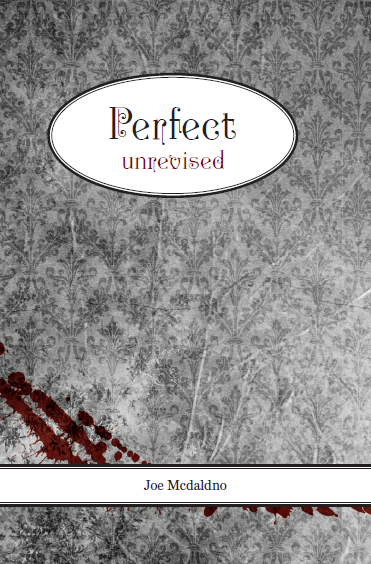 Perfect was the last game I bought last year, on New Year’s Eve, the very day it was released. And this morning I read it. I knew what to expect, I had read the first edition a long time ago, and I had a finger in the proofreading of this new edition. I still haven’t gotten the print version of the game, but the PDF is 158 pages, and from the layout I think we’ll be seeing a standard 6×9 book once it comes from the printer. The layout is very nice and the pages do not look crowded. I think the game could have fit in half that page count without problems if a more space preserving layout had been used, it is a fast read. There are a few pictures by various artists, all nice but in widely different styles. It always seems to be late Autumn. The world is stripped of colour; it is bleak and desolate. Inspectors stand upon most street corners and pay visits to the factories and storefronts and homes of the city. They are ever-present and vigilant, waiting to weed out the criminally different. They have no intention of a fair trial. They use clever psychological attacks, strange tactics, and horrific technologies to brainwash and condition these criminal miscreants into better citizenship, then re-release them into the world. 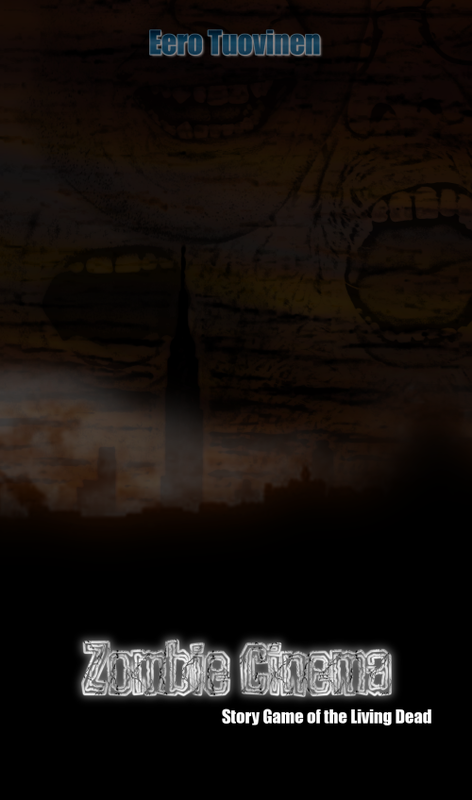 The players take the roles of those criminally different citizens, and the stories follow them and chase by inspectors. Don’t be put off by the ‘criminals’ bit, in a society like the one in Cadence everyone is a criminal, you could play a sweet love story with the rules, at least until the inspector’s catch up to your morally deviant behavior that is. The rules are very focused. No stats or skills for the characters, but instead social class, and Freedoms. A Freedom is a restriction on his actions that the PC has voluntarily taken on in order to gain a better position within the society. Do you see the wheels of 1984 turning in the background? Everything in the rules has similar very tight bonds with the setting. The PCs are assumed to succeed with their crimes, the real question is do they get caught? And if they do get caught, what effect does the conditioning have on them? The form is GM less, in the same way that Polaris is GM less. And the stories of the different characters are separate, they might cross, but there the game could be played start to finish without the different PCs even seeing each other on the street. It can be played by as little as two people, one playing a criminal and the other the law, in the form of inspectors chasing the criminal. The scene economy is strictly regulated. Each player goes through a Crime scene where a crime is committed, then a Discovery scene where investigators try to arrest the PC, if they succeed there is a Retribution scene where they try to correct the behavior of the PC. And finally a Reflection scene where the player’s turn is wrapped up, then it is the next player’s turn. Players that do not play the active criminal or the law play various NPCs if any are present in the scenes. The setting is very good. There could have been more information about Cadence, but there is enough to get play started. Most players should have been in contact with at least one of the sources of inspiration, so it is easy to fill any gaps. While the game claims to be a steam punk game, don’t expect any fancy rules or descriptions of astounding machines, they might be there in the setting but they are not given any room in the book. The rules are good. They focus on the core of the game and only that. It seems they’ll do a good job. The form is very good. I wouldn’t recommend this as a beginner’s first RPG, but for someone that knows their way around the hobby there is lots of advice in the book. Including a section on how to teach the game to others and a one page reference sheet with most of the rules, very nice touch. Yes! As soon as possible, but I think I’d like to have more than a four hour convention slot for the project. Maybe three evenings or something like that, to really get under the skins of the protagonists. An RPG that is playable by only two people, there aren’t many of those in my collection. And I do like the dystopic theme. buriedwithoutceremony.com/perfect/ – Official site for Perfect.